"Everyone needs to be shown some love. Even for a few minutes." Folks who work at the Baltimore Animal Rescue and Care Shelter (BARCS) in Maryland have found an adorable way to keep the souls under their care feeling cozy and loved when they need it most. The shelter recently shared a heartwarming video showing on-staff vet techs Dennis Moses and Amanda Greenwell giving some extra TLC to a pair of pups who'd just gotten out of surgery. 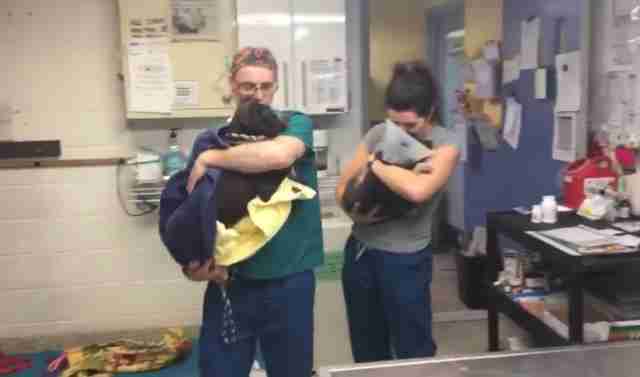 Rather than leave their furry patients to awaken from anesthesia all alone in a kennel, Moses and Greenwell welcomed them back with a slow dance, tenderly cradling them in their arms. This sort of sweet gesture happens all the time — and it's a win-win for everyone. "I think it helps them to recover," Moses told The Dodo, "and helps us with relieving some stress from today's work." This isn't the first time BARCS' bighearted approach to comforting its animals has gotten people's attention. A couple of years back, Moses was filmed singing to and rocking a puppy named Meesha who had just been spayed. "If you've ever had surgery, you wake up, and you're not sure where you're at," Moses said in an earlier interview. "It's a scary thing even for dogs and cats, especially being in the shelter and being that young." BARCS is the largest animal shelter in Maryland, taking in around 12,000 needy animals every year — and that means a lot of work for Moses and his colleagues. But they haven't forgotten that each one is an individual worthy of compassion. "We have a really great surgery team here. We do 25 to 30 surgeries per day," Moses said. "Everyone needs to be shown some love. Even for a few minutes." To learn more about this shelter's work, or to find out how you can help, visit BARCS' website.